One of my most popular recent posts was a “recipe” (two ingredients, and one of them optional – can I really call it a recipe?) for natural homemade coconut oil”hair repair” treatment. 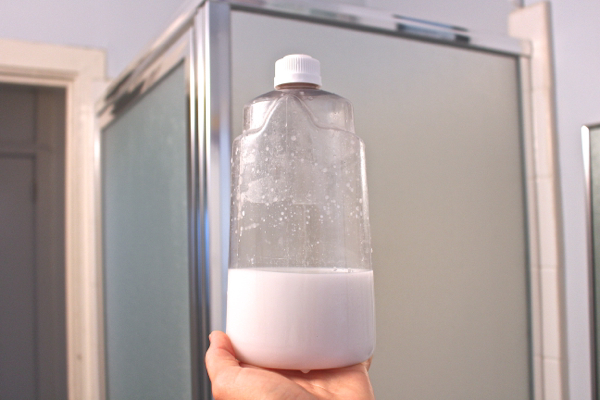 And in writing that post, I realized that I hadn’t posted anything on DIY eco-friendly body care since . . . 2009. What?!! 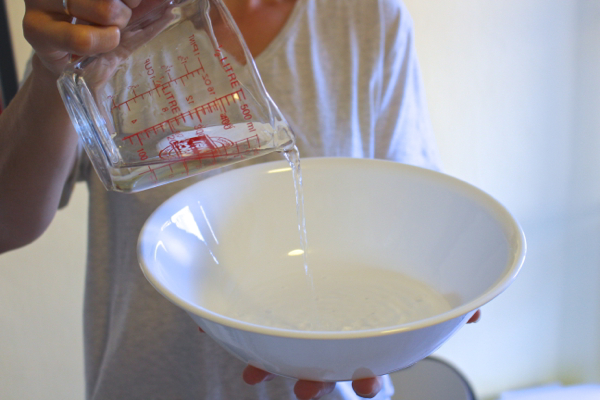 But now I’m preparing to write this post, and I can’t help but notice that the last DIY green cleaner I posted was my natural homemade liquid dishwasher detergent, and that was back in . . . 2010. Geeze . . . 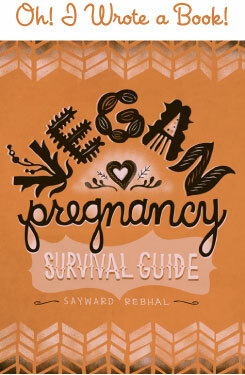 The funny thing is, I’ve been DIY green cleaning and home-making my eco-friendly body care products this entire time. I’m not quite sure why I stopped posting about them, really. But it’s been years on both accounts, and now – it’s time to remedy that! I didn’t even realize there was such a thing as daily shower spray. You know, the kind of cleaner you spray on each morning after you hop out of the shower, and you don’t even bother to wipe it off or rinse it down? You just spray it, leave it, and forget it. Umm, how did I not know about this? 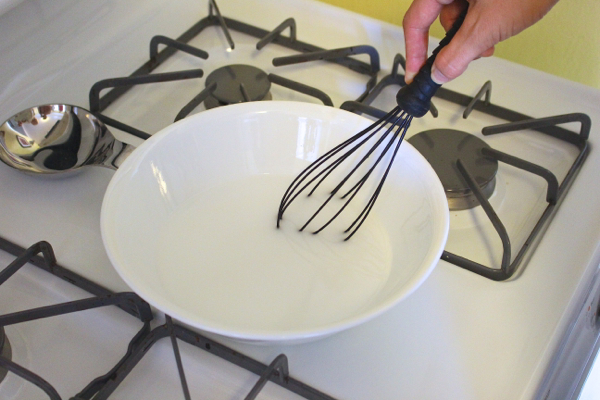 Pour the water into a non-metal mixing bowl, and then whisk in the soap. Add the rest of the ingredients and mix to fully incorporate. The solution will be sort of milky looking, which is fine and totally normal. 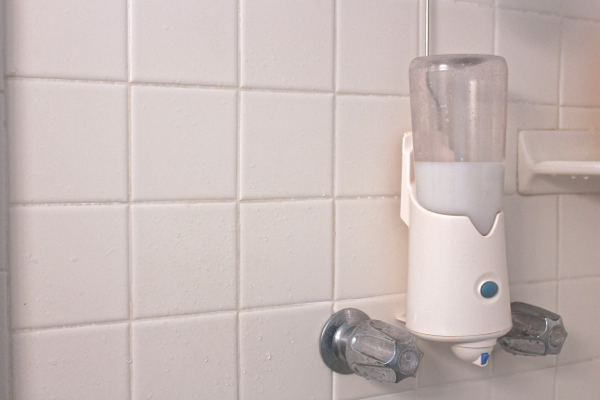 Add to an automatic shower sprayer, or store in a spray bottle. Use daily, and watch your biceps widdle away to nothing now that you never have to scrub your dang shower anymore. Hooray! If you’re doing more green cleaning tips could you update your laundry detergent recipe? I read your article about borax so I’ve been wondering if you ever reformulated your recipe (and how to reformulate mine). Thanks! Just found a generic FourThieves oil, a bit more affordable than YoungLiving, will put that to good use in my shower spray! I don’t know of such wondrous things! This is like an epiphany, you mean I don’t have to scrub my tile until my fingers prune? Can this be true? Can’t wait to give it a try- thanks for the lesson in DIY! I thought hydrogen peroxide and vinegar should always be kept separately until just ready to use–both for safety reasons (when the 2 chemicals comingle, supposedly they create a 3rd chemical that can be dangerous) and for efficacy. Thoughts? You know, I’ve read that but I’ve also read so many recipes that call for them being pre-mixed! And I’ve been using this recipe without any issues, as have so many others. Id say do what makes you comfortable, but I’m personally comfortable with this recipe and with premixing the two in general. Ooh yes, sorry for that. Always 3% unless otherwise stated! I used lavender and the castile soap I used is rose scented. So pretty! It’s on my list but right now I don’t have my own washer and dryer, so I do my clothes elsewhere and don’t use my homemade stuff. But that’s changing very soon! I’ll definitely start experimenting again once I have my own washer/dryer. I have the same automatic sprayer that you do. I’ve made my homemade mix, but now cant get the cap off the bottle in order to fill it. How did you and your not-boyfriend do it? Thanks for the recipe! We didn’t take the white cap off – we used a funnel to slowly pour it in. It’s a bit of a p.i.t.a. but definitely doable! Great – thanks for the help! Ill start looking for a funnel thatll manage. I called Dr. Susan Sumner, one of the principle researchers of the 1997 study using vinegar and hydrogen peroxide washes to decontaminate beef tissue. She is currently an Associate Dean of the College of Agriculture and Life Sciences at Virginia Tech, and she was very gracious in answering some questions about the antimicrobial properties of vinegar and hydrogen peroxide, and their possible use in removing germs from residential settings. Dr. Sumner pointed out that household bleach, or sodium hypochlorite, is the gold standard of household disinfection, as it has the broadest antimicrobial spectrum of any household disinfectant and nothing seems to match that; but there is a place for natural products that reduce germs in the environment. 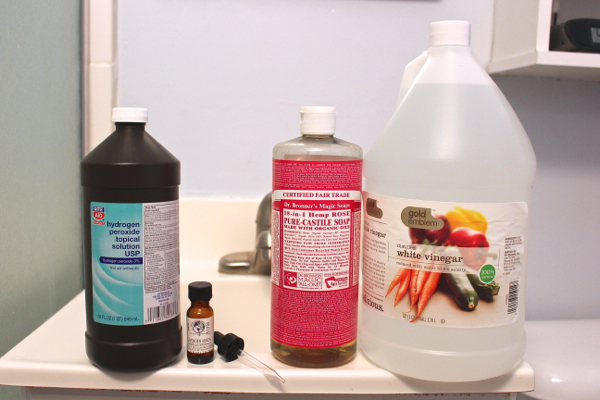 It is possible to use products such as hydrogen peroxide and vinegar to knock down germ levels to the point where they won’t cause infection, but it just isn’t possible to sterilize with them. An important point the Brightnest article missed is the fact that if your goal is to kill germs on any type of solid surface, no matter what product you plan to use, you must clean the surface first. Just like EPA-certified disinfectants, organic soil interferes with the germ killing abilities of vinegar and hydrogen peroxide. In addition neither hydrogen peroxide nor vinegar are really good at cleaning dirt, so you should use a good detergent to remove soil and rinse well before administering vinegar and then hydrogen peroxide to kill germs.